The first part of this series covered the challenges of meeting IEC 61439 standards when building an electrical switchboard. The second post covered tips on component delivery and storage, enclosure assembly, construction of power busbars and installation of devices. When it comes to the first item, the choices are rigid bars, insulated flexible bars and cables. By convention, these conductors must have a cross-section of over 6 mm2, with the actual size set after considering electrical and thermal stresses. The cross-section must account for the environment and the degree of IP protection. In the case of rigid and insulated flexible bars there may be some cutting, punching, drilling and folding. You need to be careful in carrying out such actions. For instance, when folding a bar, take into account the bend in calculations. When drilling, the diameter of holes must always be less than half the width of the bar. In connecting rigid busbars, it is best to use a calibrated and certified torque wrench. Doing so avoids uneven contact pressure, which can lead to heating and temperature spikes in the busbar when it is in carrying current. When considering a choice of insulated flexible bars or cables, the first can handle a higher current rating. Flexible bars must comply with the IEC 60332-1 standard, with a cross section chosen based on the switchgear characteristics, the length required, and the environment. Cables can be used anywhere. But, cable connections become more difficult as the power rating goes up. This due to requirement for an increasingly large cross-section, which makes it difficult to fit a cable in the space available due to what may be a too tight radius of curvature and the presence of too many terminal connection points. With regard to auxiliary and low-power circuits, the second item on the list, they include control and monitoring as well as communications. The cabling here is less than 6 mm2 diameter. Another key characteristic is that communication cabling has to meet requirements for immunity to electromagnetic disturbances. It’s a good practice to keep power cables and auxiliary circuit and other low-power cables separate. Preferably, the communication cabling will also be kept away from control/monitoring cabling, minimizing any communication issues. To prevent damage to the insulation, avoid routing such cables over sharp edges or other locations where the protective insulation can be nicked or damaged. Another general guideline to follow is to route communication cables near a grounded surface, such as the steel plate. Doing so protects against electromagnetic interference and minimizes problems. For the same reason, put the angle when a communication cable must cross a power cable as close as possible to 90o. 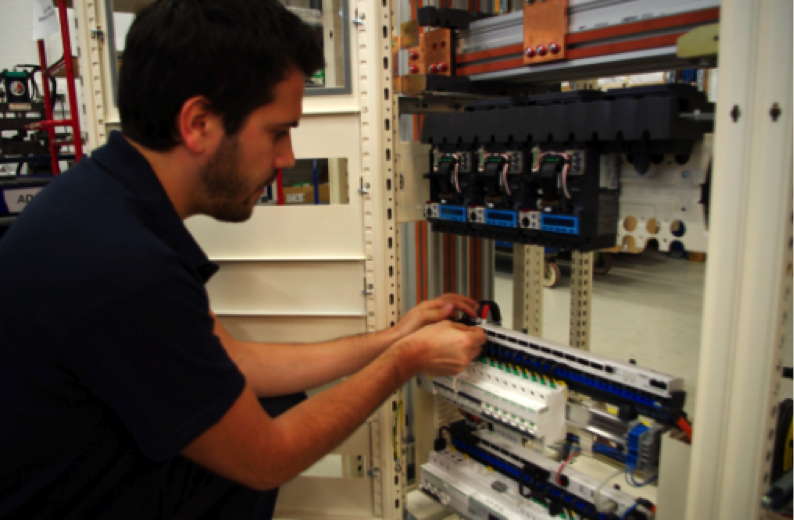 The various communication protocols – Modbus, Ethernet, Profibus, DeviceNet, CANopen – each have their own specific requirements for cabling and connections. These must be followed. The third item, labeling and marking, may be the last on the list but it is one that has many applicable sections in IEC 61439. For instance, according to the standard all switchboards must be identified in a durable, visible and legible manner. Also, the front panel should indicate the function of each device and control device. Conductors must be labeled and identified to meet the requirements of IEC 60445 and 60446. A wide range of materials can be used for labeling, including aluminum, stainless steel, double-layer plastics, and more. Double-layer plastics should be used whenever possible, as they are long-lasting. They also are non-conductive, which eliminates the possibility for a short circuit. As a good general practice, do not attach metal labels inside an enclosure. There are many different available marking techniques, such as laser/mechanical engraving, silk screening or digital printing. Whichever is used, it is a good practice to label switchboards and components in a clear and logical fashion, with warnings affixed where needed. Besides meeting standards, doing so helps initial assembly and later maintenance. With these and the previous guidelines, you’re almost done building an enclosure and switchboard. Be on the lookout for the final post in this series, with tips on factory quality inspection, packing, handling and transportation, and on-site installation and commissioning. In the meantime, for more guidelines and information, please visit our panel builder’s information page.